“About 1886 Vincent van Gogh, inspired by the great wave of Japonism sweeping over Europe, made a copy in oil of a woodblock print done by Ando Hiroshige in 1857. 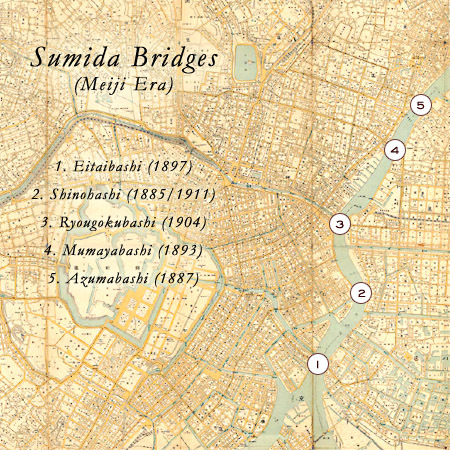 It showed Ohashi, the great bridge across the Sumida River in Edo. 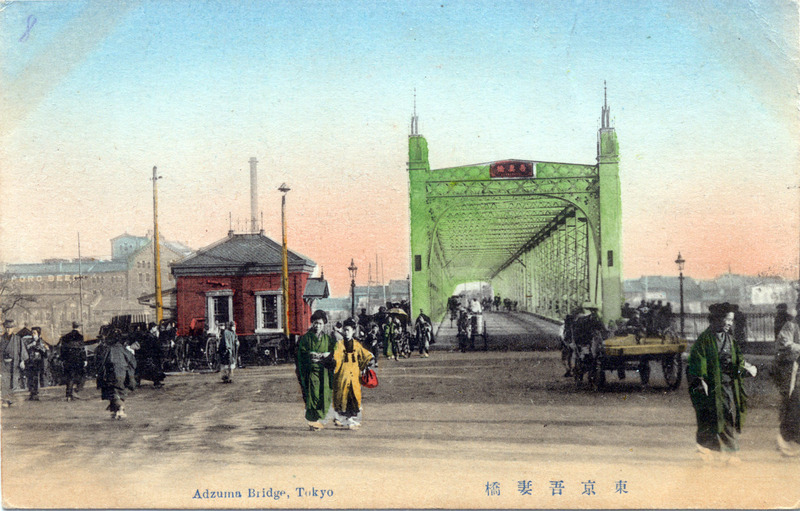 Azumabashi Bridge, Tokyo, c. 1910. Originally built for pedestrians, a signal system and tracks were later installed to allow pedestrians and trolley service to utilize the bridge. 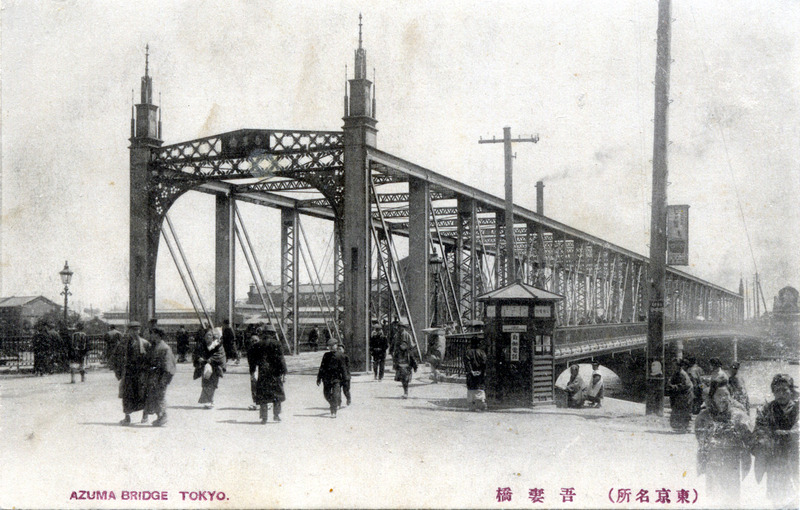 In 1923, the wooden portion of the bridge burned away in the Great Kantō earthquake. 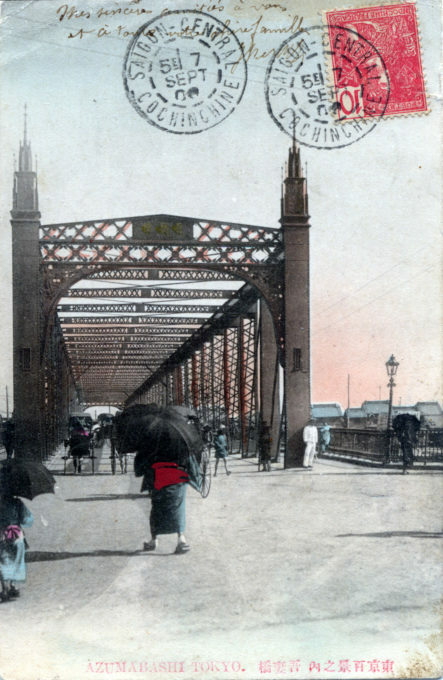 Temporary repairs kept the original 1887 span in service until 1931 when the present-day Azuma-bashi of steel and concrete was erected as its replacement. “At the very time van Gogh was being charmed by this quaint wooden structure and the print’s unusual perspective, the Japanese were replacing such bridges (or their early Western substitutes) with metal truss bridges. Japanese woodblock artists were equally advanced in the way they depicted the first iron bridge across the Sumida, Azumabashi, completed in 1887. They drew its vertical posts and diagonal eyebars in Western perspective and for good measure populated the walkway with ladies in bustles and the deck with top-hatted gentlemen in carriages. Azumabashi Bridge, Tokyo, c. 1910. In the distance, left, is the Asahi Beer brewery.